Steve Byrne is the star of the new hit TBS half hour comedy Sullivan & Son. The show is based on Steve Sullivan (played by Byrne) leaving behind his life in New York as a successful corporate attorney to take over the family bar in a working-class Pittsburgh neighborhood. 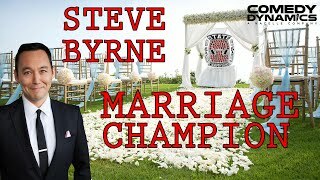 The first ten episodes averaged over 2.5 million viewers and new episodes will appear on TBS in 2013.Steve''s standup has been featured on several shows including NBC''s The Tonight Show, ABC''s Jimmy Kimmel Live, and TBS''s Conan. He has also appeared in the hit comedies The Dilemma, Couples Retreat, and Four Christmases. His most recent hour special, The Byrne Identity, premiered last year on Comedy Central to rave reviews. A true international comedian, Byrne has performed to sold-out crowds around the world. He has been a featured comic at the Just For Laughs Festival (in Montreal, Toronto and Chicago), and he has been a part of several national comedy tours including Vince Vaughn''s Wild West Comedy Tour, The Kims Of Comedy, and most recently The Sullivan & Son Comedy Tour. As a big supporter of the US troops, Steve has headlined several USO tours in Afghanistan, Iraq, Japan and Guam. Steve''s lack of ego and outstanding work ethic has helped him become one of today''s most respected comedians.